ASUS DirectCU cooling has been a fixture of their high-end graphics cards for a few years now, and it's never failed to impress. The core concept behind DirectCU's inception is that intermediary layers between the GPU core and cooler heatpipes by their very nature impedes the heat transfer process, and so having a 'flattened' array of copper heatpipes touching the GPU directly would be the most efficient mode. DirectCU Technology was introduced during the tail-end of the 40nm GPU generation, a generation which encompassed both NVIDIA's toasty Fermi-class GPUs and AMDs performance-leading dual-GPU 5970 cards. These cards had significantly higher TDP than those designs which came before, and almost every AIB manufacturer needed to come up with their own innovative design which not only improved on reference cooling, but also adapted to the changing demands of users. Low-noise was becoming an increasing focus, at a time when the trend of bigger and more powerful GPUs made things ever more difficult. Enter DirectCU III, aka DC3. This major upgrade to ASUS’ cooling solution has been fed to a number of recently released cards including: R9 390X, R9 Fury and the graphics card in the spotlight today; GTX 980Ti. 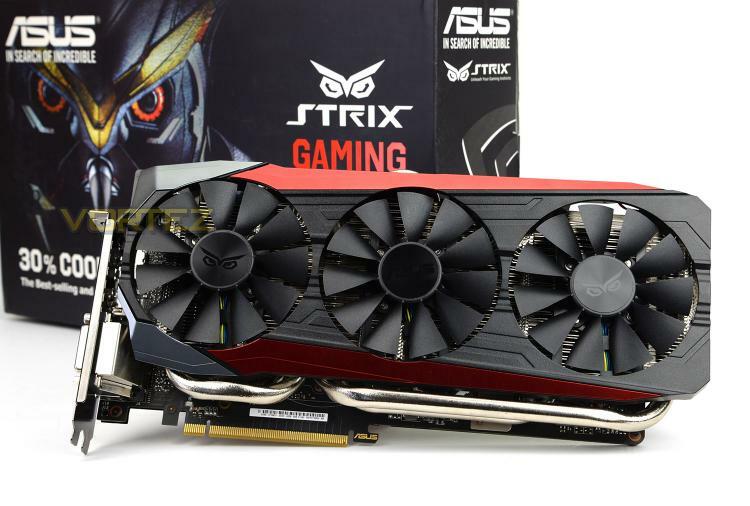 The STRIX GTX 980Ti DC3 OC arrives with a triple fan configuration which promises to deliver 30% better cooling performance and should be 3X quieter. Not only is this graphics card custom cooled but it’s also factory overclocked to squeeze even more out of NVIDIA’s flagship GPU. ASUS STRIX GTX 980 Ti gaming graphics cards packed with exclusive ASUS technologies, including DirectCU III with Triple Wing-Blade 0dB Fan Design for maximum air flow with 30% cooler and 3X quieter performance. This card features exclusive ASUS AUTO-EXTREME Technology with Super Alloy Power II for premium aerospace-grade quality and reliability. It also has GPU Tweak II with Xsplit Gamecaster, provides intuitive performance tweaking and lets you stream your gameplay instantly.